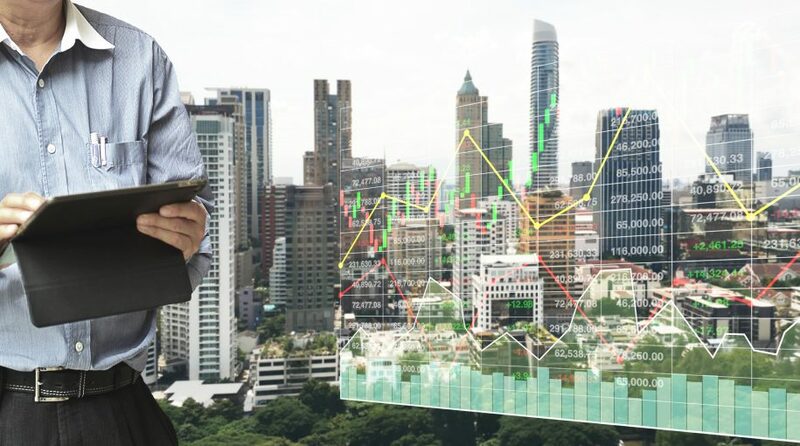 Despite last week’s declines, U.S. equities are off to a strong start with the Dow up 9 percent, the S&P 500 up 9.42 percent and the Nasdaq Composite 11.65 percent higher. As such, a positive risk appetite is returning to the capital markets, which is set the tone for small cap and cyclical equities during the month of February. In its latest Relative Weight Outlook report, Direxion mentioned that “even in the face of slowing global economic growth and increased geopolitical uncertainty, equity-market volatility collapsed markedly as risk appetite increased.” February, in particular, saw cyclicals take the lead over defensive sectors while small caps outperformed their large cap brethren. “Looking at the performance of relative weight strategies that offer amplified exposure of one market segment to another shows that the performance of U.S. small cap companies relative to U.S. large cap companies generated the best returns over the last month thanks to an environment that saw small outperform large by 1.81% with a return of 6.46%,” the report said. Heading into March, the fears of a global economic slowdown continue to permeate the capital markets. Last week, the Labor Department said that 20,000 jobs were added in February, falling well below a Dow Jones poll of economists who were expecting 180,000–it marked the weakest month of job creation since September 2017. Prior to the release of that data, fears of a global economic slowdown also came out of the Eurozone on after ECB President Mario Draghi said its growth estimate was pared down to 1.1 percent after an initial forecast of 1.7 percent released in December. Amid the wall of worry is, of course, the trade negotiations between the United States and China. Some market mavens are already saying that a permanent trade deal has already been priced into equities–evidenced by last week’s sell-offs. 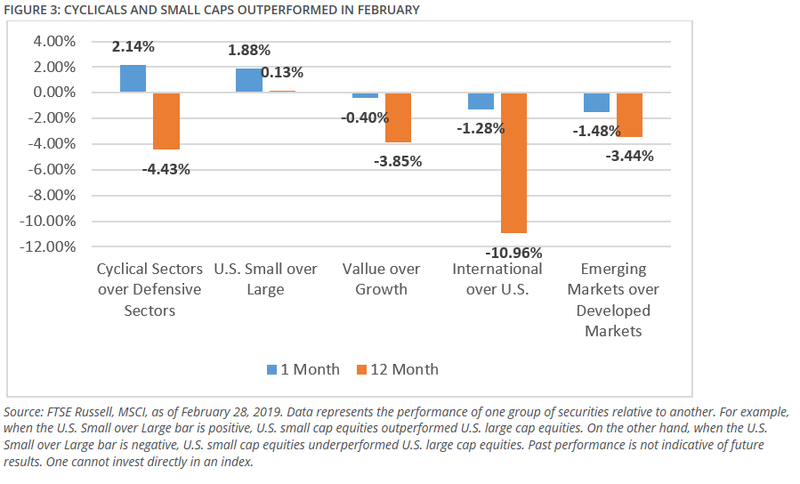 Nonetheless, can small caps continue their momentum against large caps and can cyclicals maintain their lead over defensive sectors in March? There are ETFs investors can take advantage of to substantiate their opinions. For investors looking for continued upside in U.S. cyclical sectors over defensive sectors, the Direxion MSCI Cyclicals Over Defensives ETF (NYSEArca: RWCD) offers them the ability to benefit not only from cyclical sectors potentially performing well, but from their outperformance compared to defensive sectors. Conversely, if investors believe that U.S. defensive sectors will outperform cyclical sectors, the Direxion MSCI Defensives Over Cyclicals ETF (NYSEArca: RWDC) provides a means to not only see defensive sectors perform well, but a way to capitalize on their outperformance compared to cyclical sectors. For investors looking for continued upside in large cap equities over small caps, the Direxion Russell Large Over Small Cap ETF (NYSEArca: RWLS) offers them the ability to benefit not only from large cap equities potentially performing well, but from their outperformance compared to their small cap brethren. Conversely, if investors believe that small cap equities will outperform large cap equities, the Direxion Russell Small Over Large Cap ETF (NYSEArca: RWSL) provides a means to not only see small cap stocks perform well, but a way to capitalize on their outperformance versus their large cap brethren.